Watch house Frédérique Constant produced new collection of luxury series Highlife Moonphase Chronograph. Chronograph Highlife Moonphase Chrono has automatic Caliber FC-395 and presents on steel bracelet or handmade strap from ostrich leather. Highlife Moonphase Chrono is multifunctional chronograph, which is decorated with Côte-de-Genève and set in elegant rounded case. The symbol Frédérique Constant is stamped on the crown. The dial is black or silver. There is an arms Frédérique Constant in the center of dial. The dial has big Arabic numerals. The hands are matted and steel called "leaf". One more hand shows the date on the outer side of the dial's circle. In the position of 3 hours an aims Frédérique Constant is situated from white gold 750. Frédérique Constant produced the line Highlife with the series Heartbeat. For the first time in the history of watch manufacture the balance wheel and escapement , which are the heart of mechanical watch, were opened for examination. Nowadays the line Highlife has four models: dynamic and sports Round, stylish womens' series Alure, thin with manual winding Heart Beat Day-Date and series Heart Beat Retrograde, which was shown on the exhibition Baselworld 2003. Collection Highlife is the fifth in series. In collaboration with companies Dubois-Depraz from Valee de Joux, Frederique Constant made different virsions of chronographs “Heart Beat” Heart Beat Day-Date is complicated watch, which shows day of the week and date on hand's small dial situated at the position of “6 hours”. 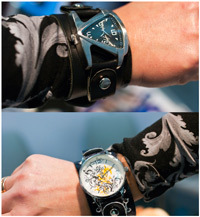 This complication was made like full modular unit and added to automatic movement with two mounts at an angle 180º. The connection between module and movement drive through the date's disk. Also, inventions of watch house Frederique Constant are functions of “returns” and “spiral”. “Double returns” function takes one minute, but passage of each segment in 30 seconds backs the hand at the original position. The speed of returns depends on another necessary component-”spiral”, “spiral” attaches to the pin second hand, making the center of the system. This element provides an immediate return of second hand-1/100 second. Presence of springs and friction intermediate wheel for maximum accuracy. In the absence of friction springs seconds hand would move at a speed of 4 seconds. This model is exclusive not just from the technical point of view but also from beauty and elegance. Such refined work gives the right to improve the model for getting Geneva hallmark. Watch company Frederique Constant is known by its tourbillons. Made on the basis of successful Caliber Heart Beat Manufacture, manufacture tourbillon Frederique Constant has features such as individually numbered tourbillon cage, silicon anchor descent and subtle system of weights and variations 28'800 BpH. Frederique Constant's chronograph are known all over the world with its unique design and flawless technique.